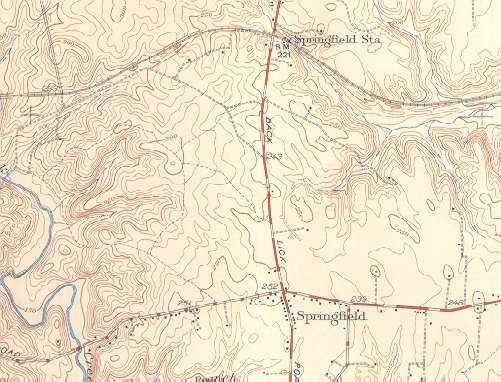 The above map shows Springfield, VA in 1945. Place the mouse cursor over the map to view the same area in the 1990s. This gives a dramatic picture of the impact that the construction of Shirley Highway and the Beltway had on a once rural area. The construction of the new Springfield interchange and the new Woodrow Wilson Bridge are expected to relieve some traffic congestion on the Interstate 95 corridor. The problem is that the Washington region provides one of the few eastern passages for both highway and rail traffic flowing north and south along the Atlantic Coast and alternate routes for this traffic are not in the planning stages.